RockUnitedReviews: L.R.S. 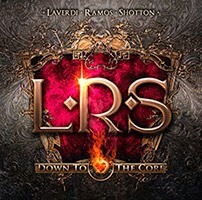 : "Down To the Core"
L.R.S. : "Down To the Core"
First of all. The moniker of L.R.S.? The first letter from each project members surname and perhaps not the best of decision? But seriously, who cares as long as the music is any good. The L stands however for vocalist Tommy LaVerdi (21 Guns) finally back in the recording studio doing the melodic rock after many years in Norway? and God knows what really. It's been too long since the excellent "Salute" album in 1992. The voice intact even if there's too many Steve Perry moves and not enough LaVerdi on a couple of tracks and especially the unshameful clone of 'Never Surrender. Poor man's Journey and very cliché-like. The last thing you need is Laverdi doing Perry, since he's actually blessed with his own unique voice and style. Hardly something you'd throw in the bin as yesterday's news. The R stands for guitarist Josh Ramos (The Storm, Le Mans, Two Fires, Hardline) and make sure to check out the excellent guitar work and tone on the record. At times Neil Schon-like, but we knew this from previous records, yeah? Finally, the S - drummer Michael Shotton (Von Groove, Airplay) and his playing is definitely a notch or three above the normal Frontiers release and the same goes for the production. The material? Overall mid-tempo AOR and slower tracks actually and do not expect to find more than one or two uptempo rockers. Alessandro Del Vecchio is the man responsible for production, keyboards as well as writing the majority of the tracks. However, Shotton is the real winner and songsmith supreme with ultra smooth AOR numbers such as "I Can Take You There" and the unbelievable classy and glossy "Universal Cry". Christ oh mighty. The stuff soft-rock dreams are made of. Let Shotton have a go at writing the bulk of the songs for the next LaVerdi album. Such a vast quality gap between this and the second rate Journey of Never Surrender. Let's get down to the core. Remove a couple of the worst Journey and you'd still end up with a very enjoyable album. I do enjoy the smooth, slick numbers of "Livin' 4 a Dream", "Almost Over You", "Shadow of a Man", "I Will Find a Way", "To Be Your Man". Welcome back LaVerdi. Top notch stuff from the very first note to the last. Simply ignore the Perry tracks next time and go for 5 R's. By the way. The years in Norway may have rubbed off as I notice the mere hint of Morten Harket? A-HA? CHASING DRAGONS - "Checkmate EP"
OUTLOUD - "Let's get Serious"
Sebastian BACH: "Give Em Hell"
KING OF TROLLS: "The Cave"
WELL HUNG HEART: "Go Forth and Multiply"
DIESEL - "Into The Fire"